Reared with care by farmers who share our values. From a long established group of carefully selected British beef farmers and suppliers who share our values and commitment to:…Delivering the highest animal welfare standards …Producing high quality beef, expertly prepared and matured for tenderness and flavour from prime cattle. …Working together to protect our environment and promote sustainable farming. 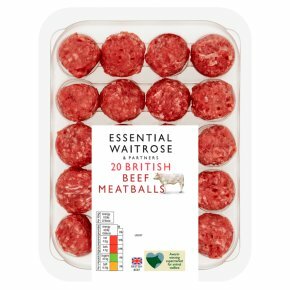 INGREDIENTS: British beef (95%), onion, sea salt, butter (milk), black pepper, preservative sodium sulphite, antioxidant sodium ascorbate. Grill Time: 10 - 12 minutes. Grilling Instructions: Preheat grill. Remove all packaging. Place on a grill rack, or thread on skewer and place under a medium heat, turning during cooking. Cook thoroughly until the juices clear and there is no pink meat. Pan Fry. Time: 10 - 12 minutes. Heat 1 tsp oil in a frying pan. Add meatballs, turn during cooking. Cook thoroughly until the juices run clear and there is no pink meat.